I am faced with a few food related dilemmas every day of my life, or at least that’s how it feels. It’s obvious that I enjoy cooking, but the truth is that I don’t always have the time to cook something new every day. I have tried doing weekly meal plans and prepping a bunch of food one day a week, then dividing it up into various portions. The problem with such efficient way of living your life is, one of my biggest dilemmas, eating the same thing over and over. Yes, I call it a First World Problem known as “food boredom.” The big problem with food boredom is that it leads to eating out more than I should. I have found that the best way to combat food boredom, and manage to have a variety of meals, is to make good use of my slow cooker. Hence, today’s recipe for Khoresht Ghaimeh slowly simmered for hours in a slow cooker. 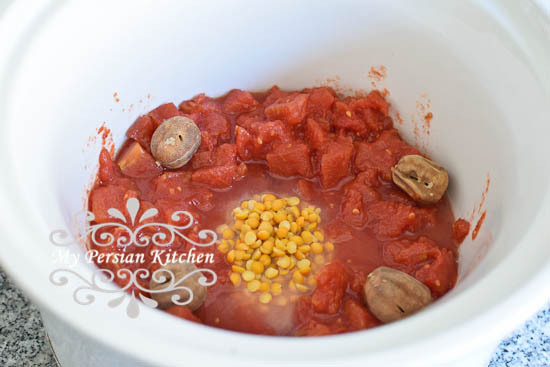 The very first khoresht that I ever made in a crockpot is indeed this recipe. 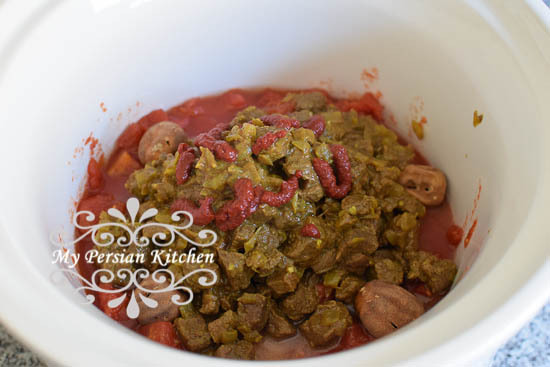 I find that Khoresht Ghaimeh, or as some also like to spell Gheymenh, it’s one of the easiest Persian stews to make because it does not require much fussing. This is a perfect recipe to make during the week or on the weekend when you are out and about all day. All it takes is a little prep work and then the slow cooker with do the rest! 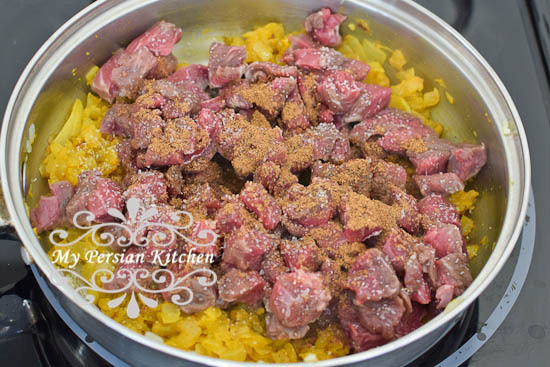 You’ll love coming home to a perfectly cooked khoresht at the end of the day! A couple of years ago when I posted my recipe for Slow Cooker Ghormeh Sabzi, I mentioned that I firmly believe that meat and poultry should be seared before they go into the slow cooker. My suggestion for this recipe is to sauté the onion, garlic, and meat the night before, or in the morning if you are an early riser and very efficient human. Since I have three crockpots I have noticed that not all cook at the same rate. For example, the one that you see in these pictures it is a slightly fancy kind, which has a timer. It works great but I usually have to cook food on “high” and only use the “low” when I simply need to keep food warm. In contrast, my other slow cooker which simply has a knob for “low,” “high,” and “warm” runs warmer and I can cook this same meal on low. For this recipe use the setting that best fits your slow cooker. Sauté onion and garlic in oil until translucent. Add turmeric, sauté for a couple of minutes, then add meat. Season with Advieh, salt, and pepper. Place split peas in a slow cooker, add stewed tomatoes on top. Pierce the Persian lemons a couple of times with a fork then add to the pot. Add the meat, onion and garlic mixture on top. Add tomato paste, one cup of water, and season with salt. Gently mix together making sure that the split peas and Persian lemons are submerged in the liquids. Cook on high for 8 hours. At the end of the 8 hours the meat and split peas will be perfectly cooked, and the juices will have a gravy like consistency. You’ll love coming home to this delicious meal. This stew is traditionally topped with French Fries. 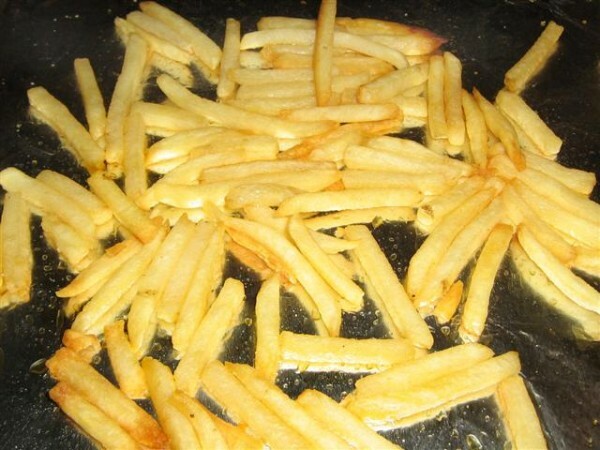 You have the option of simply frying the potatoes on the stove top. Or, you can do what I do which is simply bake them in the oven. Turn oven on to 450°. Line a cookie sheet with foil and gently spray with oil. Add potatoes in single layer. Bake for about 18 to 20 minutes. Season with salt. Once the stew is done, serve over Persian Rice, which can also be made in a Rice Cooker, and top with French Fries. Add turmeric, sauté for a couple of minutes, then add meat. Season with Advieh, salt, and pepper. Add the meat, onion and garlic mixture on top. Add tomato paste, one cup of water, and season with salt. Gently mix together making sure that the split peas and Persian lemons are submerged in the liquids. Cook on high for 8 hours. 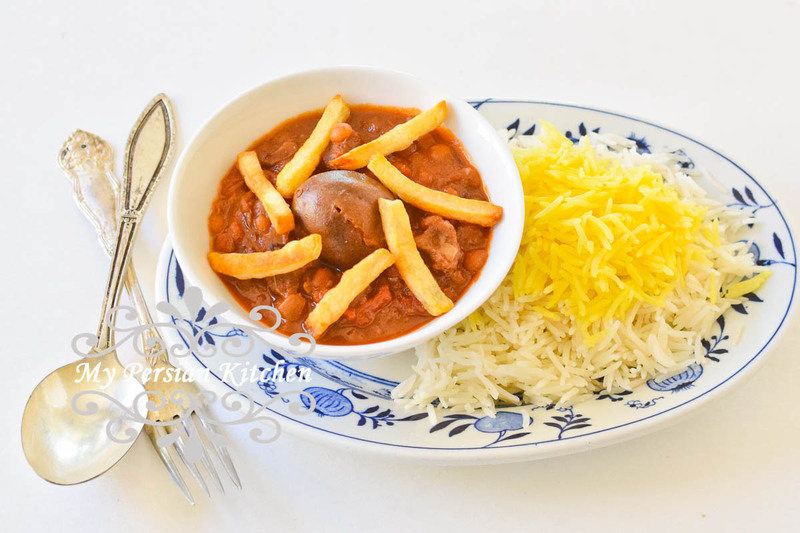 Once the stew is done, serve over Persian and topped with the French Fries. I followed the recipe and it was very easy and excellent! Loved coming home from work to it! I have made some of your other recipes and they are wonderful too. Huda, SO happy that you enjoyed this recipe!! !